I’m already late, once again, in writing about some of the films I’ve enjoyed most recently but this is another case of one you’ve almost certainly heard of and the other which may be unknown but deserves to be up there with the best. Clouds Atlas – what that title means is still a minor mystery to me, even though I noticed it was referenced to several times during the film. It certainly does little to deliver a guide as to what the film is about. Tom Hanks, Halle Berry, Hugo Weaving and a few others each portray several different characters, each of whom is related to a specific point in a timeline that spans well over a Century. It is interesting, even though-provoking, to contemplate the idea of a transcendence across the years and through generations of people. It reminded me of Crash, in the way that these lives are somehow intertwined; only covering a far greater duration of time. Perhaps my favourite experience was playing in which you attempt to match each character to each of the main actors… For the most part, this is clear as day. But, by the time the credits were rolling, I realised I’ve overlooked the vast possibility for gender cross-overs! I’m reluctant mention the Wachowski Bros. in this summary [even though I just have] because, by all accounts, Jupiter Rising isn’t anything close to what it was hyped up to be. But this film is not one of the ruddy Matrix sequels. There are parallels and Hugo Weaving portrays one of the most unique Devil performances I have seen. It’ll more than likely leave you with a lot to think about. The Desolation of Smaug – (So, they pronounce it as “Smowg” instead of “Smorg”…) Episode No.2 in the Hobbit series that chronologically precedes the Lord of the Rings. I enjoyed it, even though I still find it odd to see British actors like James Nesbitt cast amongst the rest. But I guess it suffers from the typical symptoms you’d expect from the ‘middle child’ in a trilogy – you’re always waiting for the final instalment and, well, I was cursing the screen when they ended this film at a certain point where you can only desire to see what comes next! Needless to say, I’ll be renting the final Hobbit film fairly soon. 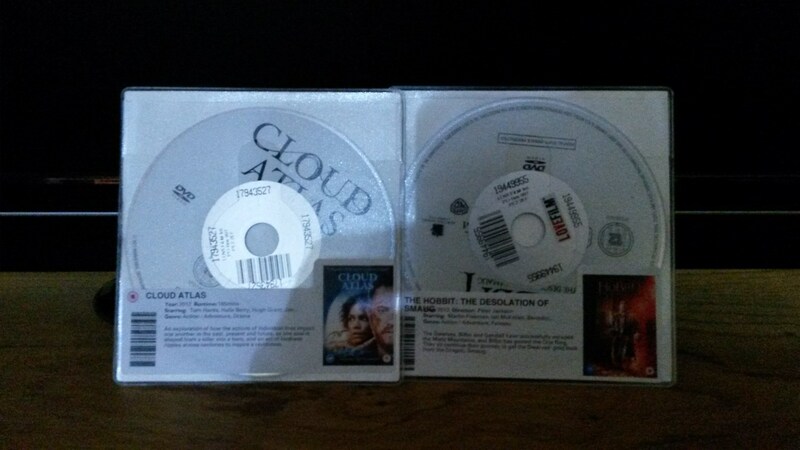 Cloud Atlas could also find its place amongst my own DVDs some day.